Skelmorlie Golf Club. 1958 ……………. Once upon a time, on a sunday in 1958 to be precise, five boys from Skelmorlie turned up at the golf club to play for the ‘Smart Trophy’. This was an annual 18 hole strokeplay competition and the only competition open for juniors at that time at Skelmorlie Golf Club. It was considered to be the ‘Junior Championship’. Taking part were two older boys in the twelve to fourteen age group , who I believe were Micheal Travers and Michael Usher, (although I`m not 100% sure) and then there was the three of us, one Jackie Paton aged 10, myself, Norman Walker aged 9 , and Alan Stevens aged 9. Jackie and I were introduced to the game when we were about 7 years old ,and Jackie still has the receipt for his golf subscription at that age…………a receipt for 7/6 , (seven shillings and sixpence) which must make him one of the longest serving members of the golf club today. 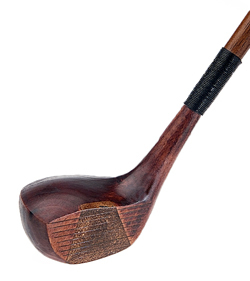 My clubs at that time were hickory shafted, cut down for me by my father and the balls you played with then were balls you found on the course or in your father`s golf bag. At that time Jackie and I played regularly, but I don`t remember Alan playing at all, so this was probably to be his first day playing golf. Now, Alan and I were and still are the same age but Alan is not so tall as I am and is lightly built. In fact, I spoke with Alan on the phone a few years ago and he told me that he was going for an x-ray, so of course the next time we spoke I asked how he had got on with that x-ray, to which he replied that they hadn`t bothered with that and had just held him up to the light. On that day in 1958 Alan turned up with his father`s golf bag and his father`s golf clubs, and I can tell you that there wasn`t much difference between Alan`s height and the length of his father`s driver. Game on. …….We played from the first tee by the resevoir, the two older boys teed off first followed by the three of us with my father who was captain that year acting as our marker. I don`t remember any of the golf but on the first tee I had probably my first confrontation with the rules of golf. I had wanted to borrow Jackie`s metalheaded driver because I could hit the ball further with it than I could with my own, but, this was NOT allowed …… can you believe it, NOT allowed. I started with a six at the first hole and wasn`t too pleased with that either. After five holes my father dived into the clubhouse to get some sheets of paper as he had quickly found out that three scorecards were not going to be enough to record our scores, and we played on. During play of the bottom five holes of the course we were informed that we would only be playing thirteen holes ……I wonder why… were we a bit slow? We eventually reached the twelth tee which is today`s seventh at the top of the ‘Bullfield’ and here was the only golf I can remember. Alan driving , swinging this unwieldy driver which on the downswing hit the ground and bounced over the ball. …….. All you golfers know this shot I`m sure. Again and again the club bounced over the ball before eventually making contact with it on the sixth attempt. …… Six off the tee and still a long way to go.. Alan later remarked to my mother ‘Mithis Walker they counted all my mithis’ …… I expect that we were all in need of some front teeth at that age. We played on and we completed the thirteen holes before making our way back to the clubhouse. At the clubhouse we were ushered into the dining room where we were given our tea sitting at one of the big square tables and the cake-stand in the centre was loaded with cake. Of course one of the older boys won the trophy. Such was life at that age it was always the big boys who came first . Who won? I have no idea. Winning score? I have no idea, it wasn`t really relevant to the three of us. We didn`t receive any trophy but we were given a lot of golfing bits and pieces, balls, tees, rulebook, pencil etc. and of course the mandatory ‘Mars bar’. The three of us had just played in our very first golf competition, and we were going home with all this loot. Amongst the three of us Jackie had the best score of 120 something, I wasn`t quite so good with 140 something but Alan returned a score which Jackie and I believe will never be equalled let alone surpassed. For the thirteen holes Alan scored 256, which is four under level twenties. ………..I just know that reading this has made some of you golfers feel very good indeed. Today we go out on the course with our electric trolleys, play a round, score ninety and we`re ready for a chair when we come back to the clubhouse because we`re tired . When I think back to that day in 1958, especially with Alan carrying that adult bag and outsize clubs, the words strength, stamina and determination come to my mind. As for my father, I wish that he`d retained these sheets of paper on which he noted our scores, as they would have provided a permanent record of our golf that day. However, I do smile a little when I think about how many times he may have sharpened his pencil in recording over 500 strokes. Jackie and I continue to play this game but Alan decided that golf was not for him, but, even today, some sixty years later when the three of us meet up, 256 always creeps into the conversation somehow . ………… A number we will remember for the rest of our lives.